Got a huge traffic to your website? That’s great, actually, but it doesn’t mean you’ll have more sales yet. There are many ways you can try to switch the flow on your site into real sales. And, one of the most striking ones is the usage of popups. We have checked many various types of popups that are there to benefit your website and enhance your sales. 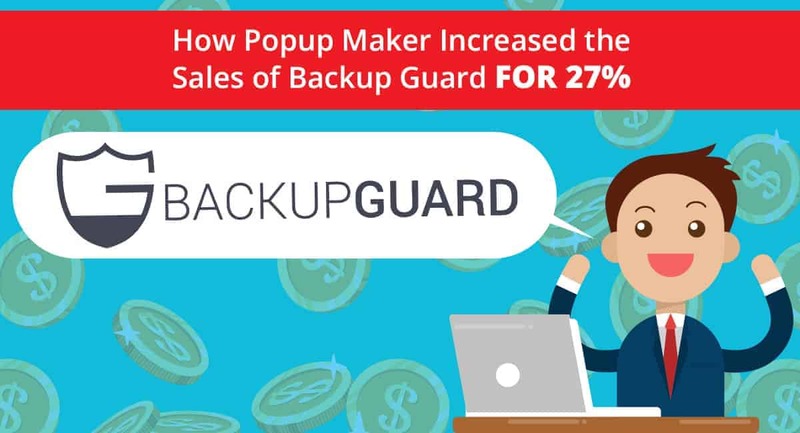 In this post, we’re going to see how BackupGuard has used a popup of Popup Maker to escalate the sales on their website. We provide backup and disaster recovery services in the easiest way possible; saving time and securing data. BackupGuard is a company, providing an extra useful tool for backup and restore. The company offers a Backup service, a WordPress plugin and a Magento extension. 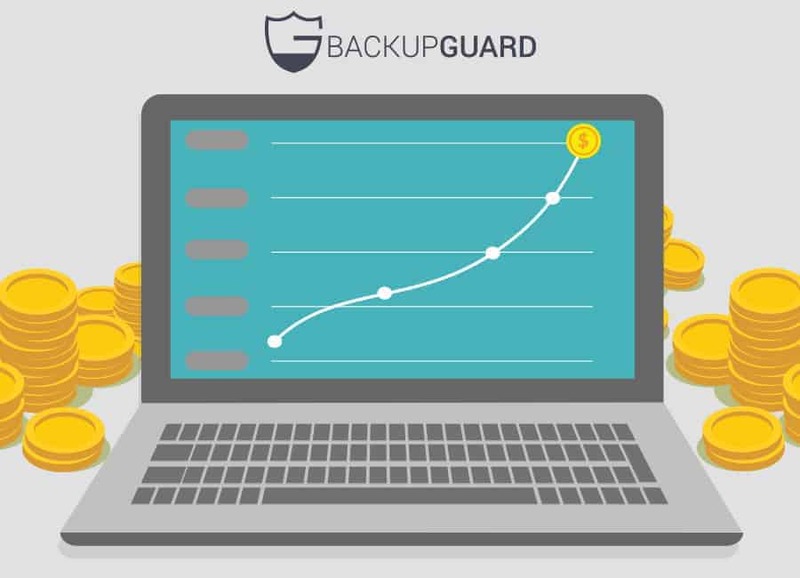 So what BackupGuard actually does? It’s kind of a safe for you to keep your data protected in case you lose it by mistake. You may delete some files, there may be a hack attack, your computer may be damaged. In all these, and such other cases, BackupGard is a perfect tool to save your data and restore if needed! To be short, BackupGuard is a cloud storage to keep your files safe! What kind of popup did they use? One of the greatest ways to fascinate the new customers of your site is presenting a discount for the first product they purchase. It has been proven among website owners that an exit popup with a spectacular and a thrilling offer is the best technique to get a new customer for your site! And what can be better and more dynamic than granting a discount code for the first purchase? That’s exactly what BackupGuard team did! On the product page of the BackupGuard, where they offer the WordPress plugin of their own, they added an Exit popup via Popup Maker, with a discount proposal. It’s important to note a great point they have considered using such a popup – the popup is set to be shown only once per visitor. In such cases, you should make sure your visitors are not overusing the promotion you provide. So, if a visitor sees the popup with the promo once, he/she won’t see it anymore. How did the sales increase? Discount proposals are the best cockshots to attract visitors and cause them to shop your products. Practice shows that the perfect moment to display the popup with a discount proposal is when the visitor is preparing to leave your site. And, to go in more details, it’s rather important to know on which pages exactly to add the popup with the offer. So, it’s quite obvious, that in this case the best solution is adding the popup to the product pages. As this is where the users are to make their purchases. Keeping this in mind, the BackupGuard team added the exit popup with the discount coupon proposal and you know what? The sales really boosted after a while! According to statistics, the sales rose for about 27%! 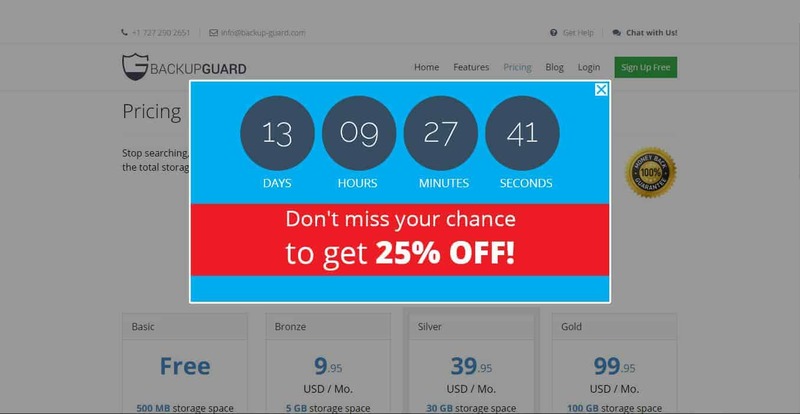 In future plans, they plan to use another, very useful and productive type of a popup – Countdown popup with offers. Previous Post:Increase Your Sales With a Countdown Popup!